Kikay Corner > advocacy > Clean & Clear Top Best Friends 2011 Asia Contest is on! Clean & Clear Top Best Friends 2011 Asia Contest is on! Clean & Clear, The Young Skin Expert, celebrates friendships as it launches its Top Best Friends 2011 Asia. Calling Best Friends (female citizens) who are from 14 to 24 years old at the time of entry to register via www.facebook.com/cleanclearphilippines. 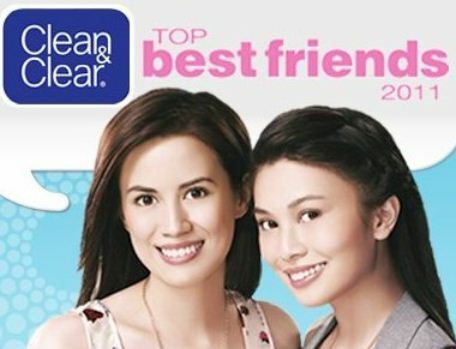 What exactly is The Clean & Clear Top Best Friends 2011? Clean & Clear believes in the beauty of friendship and this contest is an avenue for “Best Friends” to connect with each other in a fun and engaging environment through social networking and multi-media community. Essentially housed via Facebook. This is your chance to talk about how you and your best friend empower each other through your friendship! I, for one, am a believer that we are built for relationships. It’s really one of the things that I have always treasured from the time that I was sent to Preschool! We all treasure friendship like we should and this Clean & Clear Top Best Friends 2011 Asia Contest is a challenge for the best friends out there to celebrate. What’s at stake, you ask. A basket of Clean & Clear products valued at up to one (1) year’s supply for each winner. Participation in Webisodes (Beauty workshop, styling makeover, photography tutorial) featuring the seven winning pairs. Terms and conditions set by Organizer shall apply in this case. And I ain’t done yet. A chance to appear in a Clean & Clear advertisement. Sweet, right!? What can be more fun than having the chance for you and your best friend to appear in a Clean & Clear advertisement and ten thousand grand (in dollars, at that) ,no less. Each participant is allowed to enter the Contest once to be a member of a pair of friends. Multiple pairs of friends with the same participant will not be allowed. Each participating pair is permitted to submit only one (1) entry (Please also refer to I(B) above). If more than one entry is received for the same participating pair, only one (1) submission shall be qualified by the Organizer as eligible for participation in this Contest. Participants should not be under any other commercial contracts with any modelling agencies at the time of entering into the Contest. Participant uploading the photograph should ensure that she has necessary consent from her best friend for uploading the photograph and her best friend is not under anycommercial contract with any modelling at the time of participation in the Contest. One (1) winning pair from each country (Singapore, Indonesia, India andPhilippines) and the final winning pair will be selected from all eligible entries through an online popularity vote and a panel of judges constituted by the Organizer. Decision of the judges shall be final. Subject to extension by Organizer, the winning pair will be selected approximately one (1) month from the expiration of the Contest Period. The selected winning pair will be notified within twenty (20) days from selection ofwinning pair via the contact details as submitted. The winning pair from each country shall participate in the grand final Contest in Singapore for selection of one pair as the CLEAN & CLEAR® Top Best Friends 2011. Dates and details shall be provided to winners. The grand winning pair shall be selected by the Organizer on the basis of public voting and selection by a panel of judgesconstituted by the Organizer.